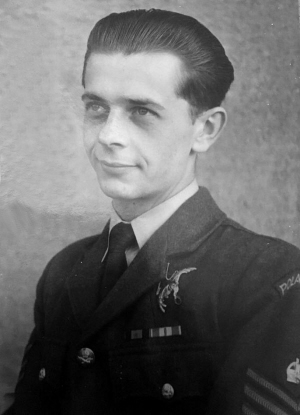 Warrant Officer Pilot Zbigniew Klatkiewicz, 782158, 300 (Polish) Squadron, Royal Air Force. Zbigniew Klatkiewicz was born in Oporowo, Szamotuly, Poland on the 28th March 1922. He married Marjorie Iseton (b. 1923) in the Spring of 1947 in the Durham S.E. Registration District. The couple had two sons: Bernard M. T. born in Newcastle in 1949 and Paul M. born in Wakefield in 1954. Klatkiewicz became a Lancaster pilot with 300 Squadron, which was formed at Bramcote, Warwickshire on the 1st July 1940 as a bomber squadron. It was the first Polish manned bomber squadron to form in the RAF and most of the original bomber crews had previously served in Polish fighter units. Klatkiewicz would have been only 17 years of age at the start of WW2 and the German invasion of Poland, so it is unlikely that he was a fighter pilot at that early age, although he may have been in the Polish Air Force and made his way to England to escape the Nazi oppression. Over a span of 2.5 years, 300 (Polish) Squadron logged 3,684 operational sorties and dropped nearly 10,000 tons of bombs on enemy objectives. The squadron won 107 decorations comprising 1 OBE, 1 BEM, 1 DSO, 1 MC, 63 DFCs, 1 DCM, 1 CGM, 1 MM and 37 DFMs. They flew Lancaster B1 and BIII bombers from April 1944 onwards, and before that Wellingtons. They were based at RAF Faldingworth in Lincolnshire from March 1944 and before that RAF Ingham and RAF Hemswell. Sometime after WW2 and his marriage in N.E. England, Zbigniew Klatkiewicz moved to live in Wakefield, where he was employed as a baker. He then opened a grocers shop at the junction of Dale Street and Church Street in Ossett, which was called simply "Klat's". Zbigniew Klatkiewicz died on the 1st September 1991, aged 79 years and was buried at Newark on Trent, Nottinghamshire with other Polish airmen from 300 Squadron.